Are you ready to become more effective with helping your patients manage their weight? Still frustrated with not knowing what method is effective for weight loss? Would your practice benefit if you had simple guidelines and strategies that you can follow that are effective for weight management? Would you like to know how to effectively encourage patients to follow healthy eating guidelines , meal portions and healthy eating habits? Does initiating conversation with patients about a high BMI make you feel uncomfortable , and you wish you could be more effective? Do you struggle with knowing how to help people lose weight when they are on different medications , like antipsychotics, and insulin? 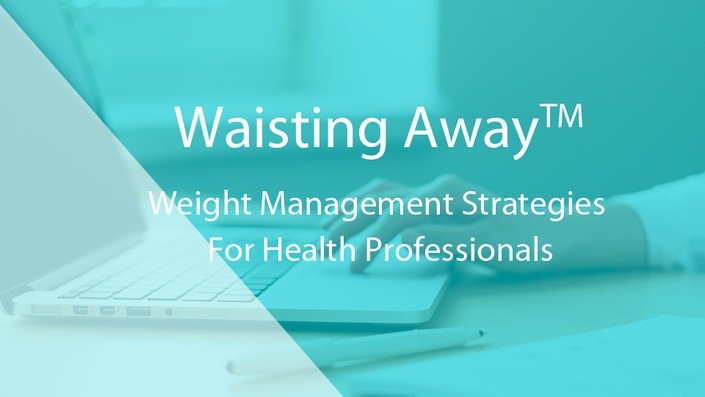 Waisting Away™ is a course on empowering health professionals with weight management knowledge, up-to-date research, and the skills to practice health at ANY size! This online workshop is for health professionals who are not experts in weight &/or obesity management, but work with people who would greatly benefit and appreciate positive ways to facilitate their health goals. Waisting Away™ is READY TO GO practical with hands on strategies, tools and handouts to help your overweight/obese client/patients be healthier. 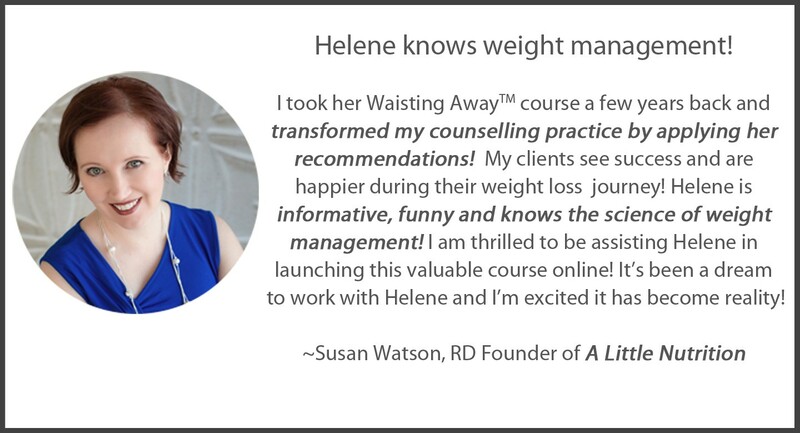 If you have wanted to attend one of Helene's live Waisting Away™ workshops, but couldn't, now is your time! Sign up now and get the tools you need to for working in weight management! Motivational interviewing in weight management-does it really work? Do you want to know what behavioural strategies work that will support weight loss? Do you know how to manage patients motivation/ will power, and want to learn what tools actually work? Do you want to gain an understanding of post-op weight regain, and how to manage patient care? Are you ready to learn about simple tips that you can incorporate to into your practice that are effective for weight management? Any Professional involved with helping people to become healthy at any size! A certificate of attendance will be provided for CE credits at the completion of the 3 session course. "I am loving your Waisting away course. It is helping me get comfortable to practice and you provide great advice. Thank you for doing the course and lending your expertise. This area of private practice is the right place for me to be because I see that RD's like you are willing to connect and share and develop courses for people like me that have had blinders on for too long and stayed where they did because they were afraid to make the change. You make the fear of change (for me) go down to a 1 on 10!" Hélène Charlebois, BSc, RD is a Registered Dietitian-Nutrition Consultant from Ottawa with over 25 years experience in helping patients/clients with weight management. She is certified through the Academy of Nutrition & Dietetics as an Adult Weight Management Specialist at the Levels 1 & 2 and is considered a weight management expert. She is a member the Canadian Obesity Network, The Society Of Obesity, the Academy of Nutrition & Dietetics, the Dietitians of Canada (past board member and past president of the Consulting Dietitians of Canada), the College of Dietitians of Ontario, Canadian Nutrition Society and the Canadian Diabetes Association. Is the Food Industry to Blame? Motivational Interviewing -Does it really help? Waisting Away TM has been presented in over 40 locations across Canada to more than 2000 Health Professionals. The course starts on November 14th, with new sessions being released on November 21st and 28th. The course days and times are when the material will launch, HOWEVER - it will be up for you to watch at your convenience! You will have UNLIMITED ACCESS to this course and can download all the resources provided. If you can't attend the live sessions, that's o.k. The live sessions will be recorded and uploaded on to this site within a few minutes of it being over. What if I have questions during the course? We love to get questions, so not a problem! If you have a question in between the course sessions, email info@nutritionacademy.co. Susan will compile the questions, and Helene will answer them as they come in. The questions will be archived on the course site so you can see other people questions too (which we will keep anonymous if you would like). Also, we will be encouraging students to ask their questions in the private Facebook group so that we can all support each other and share our practice experiences.